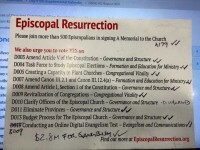 A wrap up on what happened to the Memorial and the resolutions put forward to the 78th General Convention of the Episcopal Church. 6 resolutions passed essentially unchanged; 2 resolutions passed with modifications; one resolution discharged, but with significant provisions combined into another resolution; one resolution caused intense conversation and was referred to a study committee. One Memorial changed the conversation around the church. As of the Morning of June 26, Resolution D019 Conducting an Online Digital Evangelism Test is the only Episcopal Resurrection resolution out of Committee. This post tracks where all ten resolutions are as of this posting. Every resolution filed with the General Convention must have a public hearing where interested Episcopalians (not limited to deputies and bishops) may testify on the pros and cons of the resolution. Hearing from the Church is the first step in committee action on a resolution. Hearing dates and times will be posted here. This post excerpts Scott Gunn’s thoughts on the Memorial and 10 resolutions offered here at Episcopal Resurrection. His comments are part of Scott’s epic Tangled Up in Blue series in which he writes on every piece of legislation proposed for the 78th General Convention. Church planter and author Ken Howard recently shared his thoughts on the Memorial to the Church and the accompanying resolutions in a series of posts at his blog Paradoxical Thinking. This post links to his blog entries and shares some of his thinking on Episcopal Resurrection. This blog posts lists the 10 resolutions by resolution number filed with the General Convention and shows the committee to which each resolution is assigned. Links to the resolutions in this post link to the current version of the text and so will remain working links through the convention. Beyond searching the internet for product reviews, restaurant recommendations, and the rest of the micro-moment decisions, people around the world ask Does God love me?, Who is Jesus?, and Will I go to heaven? Being there in those micro-moments also flips the script on Evangelism. Instead of being a nuisance, the digital evangelist answers the actual questions a person has in the moment when she or he really wants guidance. Frank Logue writes on a resolution calling the church to Conducting an Online Digital Evangelism Test. In this round up of links to posts on D005: Creating the Capacity to Plant Churches, Adam Trambley explains the church planting resolution itself while Susan Brown Snook makes an excellent case for starting new congregations based on research for her book on Episcopal church planting, and Frank Logue busts myths common in church planting discussions and offers the truth he has observed in 18 years of working with new Episcopal congregations. Adam Trambley writes about the resolution “D010: Clarify Officers of the Episcopal Church” clarifying its intent and showing its effect on positions in the churchwide governance including the Presiding Bishop, President of the House of Deputies, Executive Director, and others. He also addresses Resolution D006: Amend Canons I.3 and I.4.3. The Acts 8 Moment invited bloggers to write about “A Memorial to the Church”. The responses are summarized here with links to the full text of the blog posts. This website is the result of conversations over the last few months among a group of Episcopalians who are passionate about our church’s health and witness to the world. We offer A Memorial to the Church along with many signatories from across the church.